Since SPx debuted in the mid-1990s, it has never been a brand to shy away from wild designs. Nearly two decades later that trend continues. Not only does 2013-14 SPx Hockey have a lot of visual flair, but the hits and premium inserts long-time fans of the brand have come to expect. 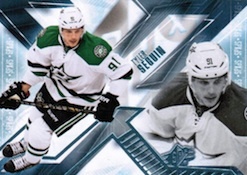 Every 2013-14 SPx Hockey box comes with four major cards. At least one is an Auto Rookie Jersey. Featuring players from both the 2012-13 and 2013-14 rookie classes, they're divided into to tiers. Level 1 cards are numbered to 699. Rarer Level 2 cards are limited to 399 copies each. Parallels include Spectrum Auto Rookie Patch cards numbered to 30. These also have inscriptions to go along with the signature. Boxes also include a pair of memorabilia cards, a Rookie Materials and either a Winning Materials or Winning Materials Combo card. 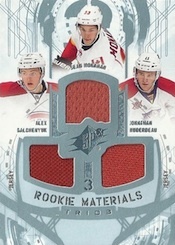 Rookie Materials have anywhere from one to three players and also come with patch versions. The same can be said of Winning Materials. SPx Shadow Box cards come in signed and unsigned versions. Basic Shadow Box cards fall 1:24 packs. Rookie Signatures (1:2,400 packs) and Signatures (1:4,800 packs) are extremely tough pulls. 2013-14 SPx Hockey gets back to its roots with 1996-97 SPx Retro. Veterans are inserted 1:7.5 packs while rookies land 1:30 packs. 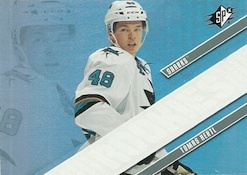 There are also 1996-97 SPx Retro Rookie Autographs (1:72 packs). 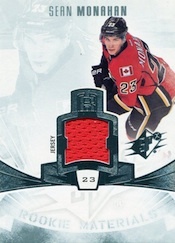 Because it was released prior to the start of the season, 2013 rookies were excluded from 2013-14 Upper Deck Trilogy Hockey. 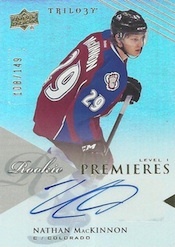 The checklist expands with SPx, adding more autographed Trilogy rookies like Nathan MacKinnon. Like the main set, Trilogy Autographed Rookies come in three levels numbered to 149, 49 and 25. 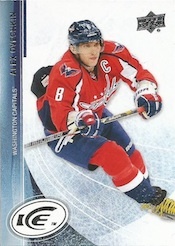 Collectors can also find randomly inserted autographed buybacks from Wayne Gretzky and more. 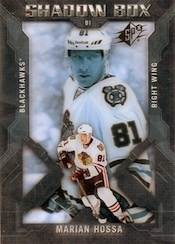 The 2013-14 SPx Hockey base set has 100 cards. Collectors can also find rookie short prints (1:2.5 packs) and rookie SSP cards (1:10 packs). Every box includes a bonus pack of 2013-14 UD Ice. 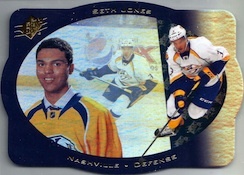 Each includes an Ice Premieres rookie card numbered to 999, 499, 249 or 99. UD Ice bonus packs also have four base cards. 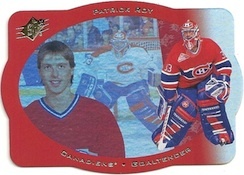 PARALLEL CARDS: Patch Spectrum #/30 - most of the patch parallels are inscribed. Found in bonus UD Ice packs. 1 pack per hobby box. Found in bonus UD Ice packs. Stick to the Cup if you can afford. Delivers a bang for your buck ! Not too impressed with my two boxes and 6 loose packs. What happened to this product? This product used to offer winning material jersey autos, patch autos, Flashback Fabric Autos (in my opinion one of the better mid-level sticker auto sets) of almost all the star players and many HOF’s. Now there is no veteran or HOF autos in here at all besides 3 SSP shadow box autos or ICE buybacks (who knows if they are even in there…). 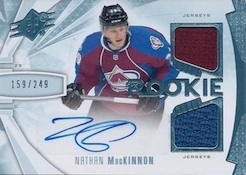 Just because it is a double rookie class doesn’t mean you can take out everything else besides the rookies (not to mention only the MacKinnon is even worth the price of a box in secondary market). Stop making products like football the rookies alone can’t support the product. Base rookie cards are worth nothing the rookie materials are worth nothing this used to be a great product but is now terrible. Very disappointing-fewer packs,fewer cards.few autos of note -certainly not worthy of 100.00 plus.It simply does not pay to buy a box anymore.Seven months into the season and still no worthy product with hard signatures.What has happened to SPX ? I fear there is more crap to come ! 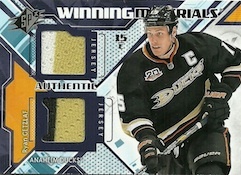 Love design of base cards, but agree with others, marginal value especially for some of the relic/hits. Did like the bonus ice pack and trilogy updates, but other than that seemed a little bland in comparison to other products. 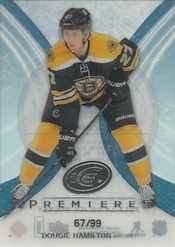 Where the hell is # 181 Jonas Brodin /499??? Its 4 years i’m waiting for it..
2013-14 Upper Deck SPx Hockey HOBBY Box 4 Hits RC Auto Jersey? 1996-97 Retro?